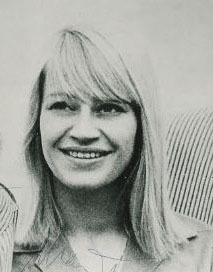 In 1961, Mary Travers joined with Peter Yarrow and Paul Stookey to form the folk trio, Peter, Paul, and Mary. Their repertoire ranged from traditional folk songs to contemporary music in that tradition. During its lifetime the group earned five Grammy awards, becoming known for such staples as Puff the Magic Dragon, composed by Yarrow and Leonard Lipton, John Denver's Leaving on a Jet Plane, which became their only #1 hit, and Bob Dylan's Blowin' in the Wind. In 1962, the group took a neglected 1949 song written by Pete Seeger and Lee Hays, If I Had a Hammer, and made it a top-ten hit. Peter, Paul and Mary's progressive, anti-war message struck a chord with the American public. After the band split up in 1971, Travers released five solo albums over the next decade, none of them earning significant traction. She was diagnosed with leukemia and received a bone marrow transplant. By 2006, Travers felt she had a new lease on life, but the leukemia recurred and she died at a Danbury, Connecticut hospital in 2009.